Have you been searching for that stunning property with a gorgeous view? 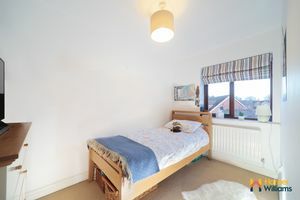 Then look no further, as we have found the perfect property for you! 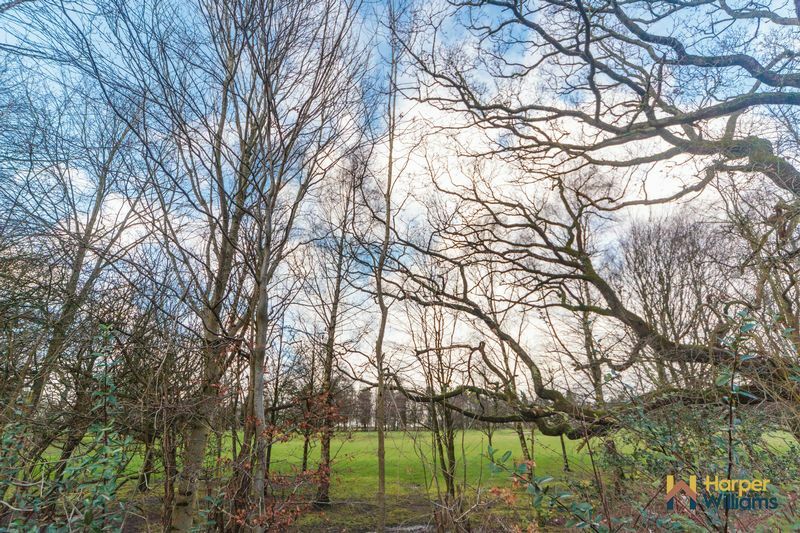 Situated along the picturesque Stonyhurst Crescent development in Culcheth, this gem of a property is tucked away off a quiet corner facing the 14th hole across the beautiful Leigh Golf Course. 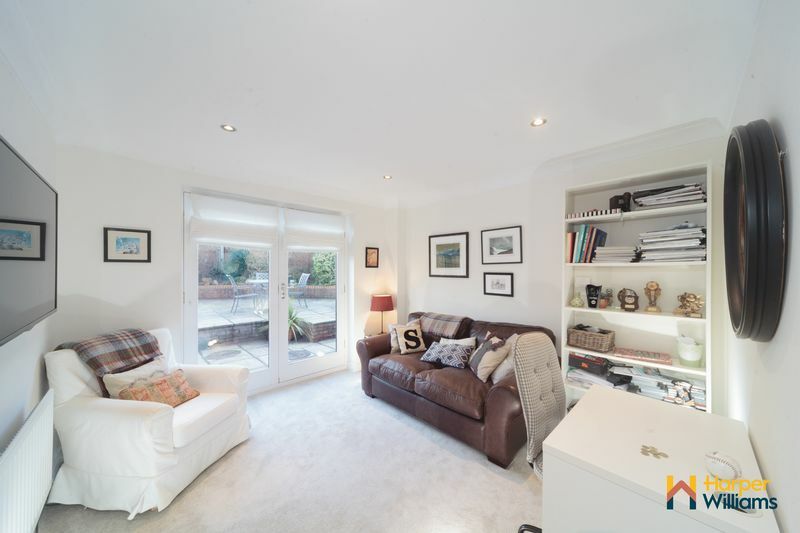 Tastefully decorated and finished to a high standard which is a credit to the current owners, this fabulous three storey semi-detached town house, oozes style and charisma throughout. Arguably positioned in one of the best spots in Culcheth off Twiss Green Lane close to Twiss Green Primary School, an internal viewing will reveal an entrance hallway, downstairs WC, utility room and sitting room/ 4th bedroom to the ground floor. 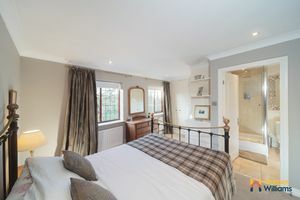 To the first floor there is a 'Wow Factor' chic and sophisticated lounge which boasts breath-taking views across the golf course including a feature balcony, a dining kitchen with shaker style units and a welcoming landing area with a fitted walk-in wardrobe to the first floor. To the second floor, there is a stylish master suite which also benefits from 'jaw-dropping' views and an ensuite shower room, a family bathroom and two further bedrooms. Externally, the property occupies a corner plot position and has the added advantage of being sunny aspect to the rear and has an integral single garage. 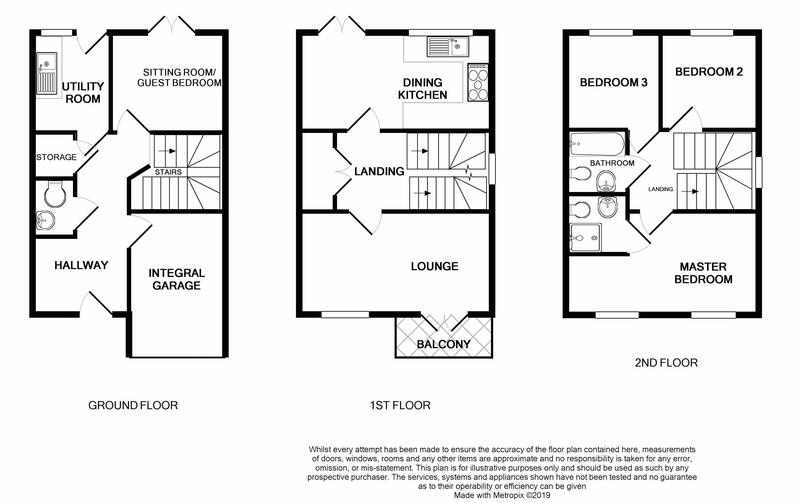 Offering further scope for potential purchasers, the current sellers have obtained detailed planning permission for a single storey ground floor wrap around extension to re-design the ground floor living space. (Plans can be available on request). 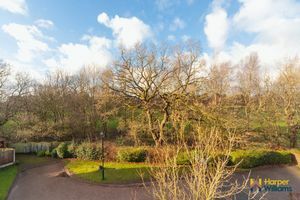 Only once in a blue moon to do these properties come to the open market, so registering your early interest is highly recommended! An inviting entrance hall with an internal door into the single garage, a door into the cloakroom/ WC, utility and ground floor bedroom/ sitting room. There is a large storage cupboard, wood effect laminate flooring, coved ceiling and spotlights, central heating radiator and staircase to the first floor. 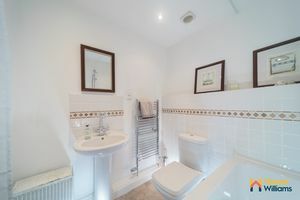 Fitted with a two piece suite in white with a low level WC and wall mounted wash hand basin with chrome fittings and chrome ladder style radiator. Spotlight to the ceiling and wood laminate finish flooring. 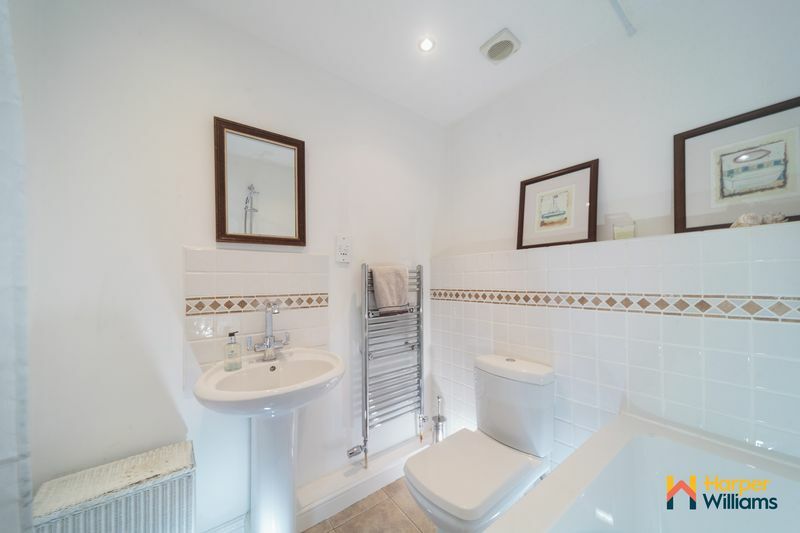 A spacious utility fitted with cream base units with complementary wooden worktops over incorporating a stainless steel sink unit with a mixer tap and drainer, plumbed for a washing machine, space for a dryer, wall mounted boiler, central heating radiator and complementary tiled flooring. 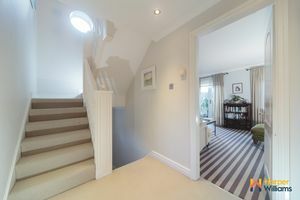 There is an entrance door onto the rear garden. Spotlights to the ceiling. 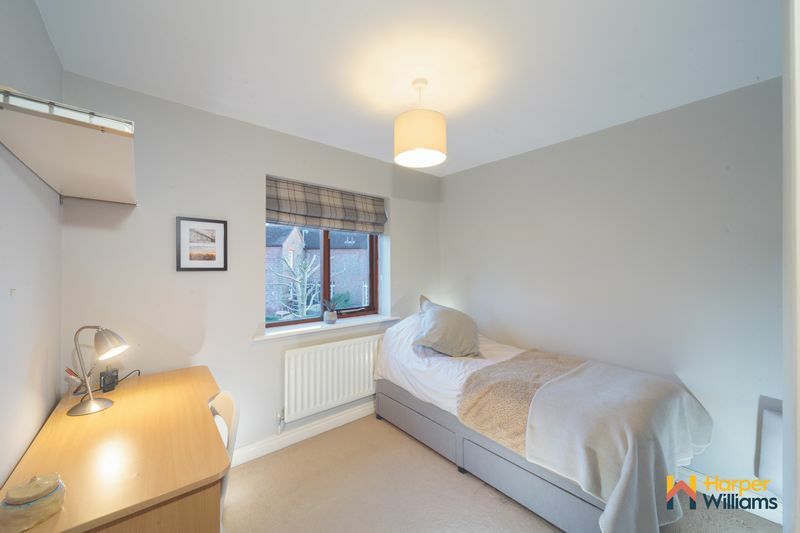 A versatile room which is currently used as a sitting room/ guest bedroom with double doors opening onto the rear garden, coved ceiling and spotlights, central heating radiator and TV point. 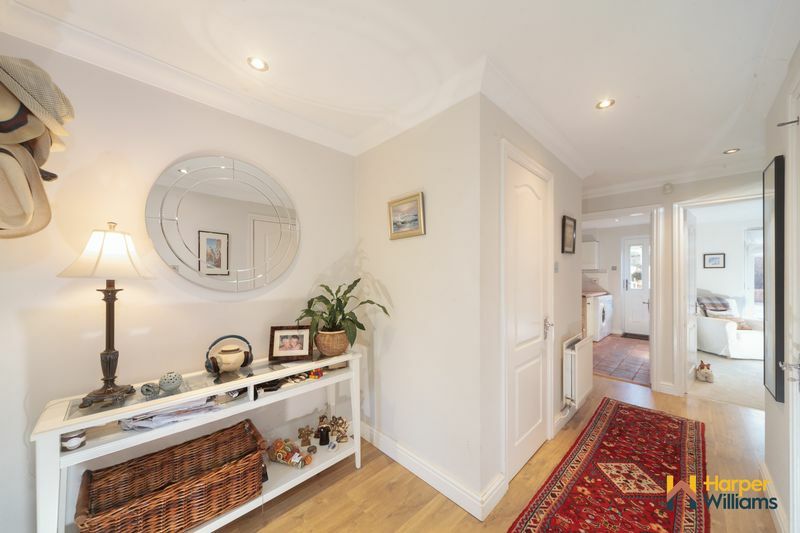 A spacious landing with a double walk-in wardrobe ideal for extra storage, staircase to the second floor, central heating radiator, spotlights and access to the lounge and kitchen. A chic and sophisticated lounge which adds a big 'Wow Factor' to the first floor which is light and airy benefiting from a feature balcony through double doors, which is perfect for taking in the fabulous views across the golf course beyond, and an additional double glazed window allowing further natural light. 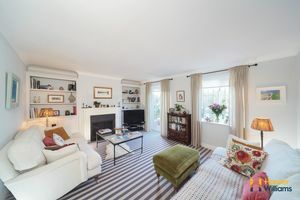 Cleverly designed by the current owners, there is built in shelving into each alcove around the chimney breast which features a focal point fireplace which houses a contemporary gas fire. Coved ceiling. 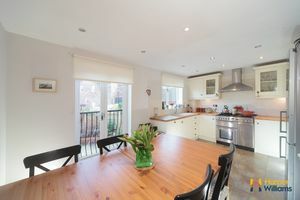 A good size dining kitchen which boasts a range of fitted 'shaker' style cream wall and base units with complementary wooden worktops over incorporating a range of integrated appliances which include a dishwasher, 6-ring range cooker with a stainless steel extractor hood over, fridge/freezer, integrated sink with a mixer tap and drainer, complementary part tiled walls and contrasting tiled floor which completes the look. 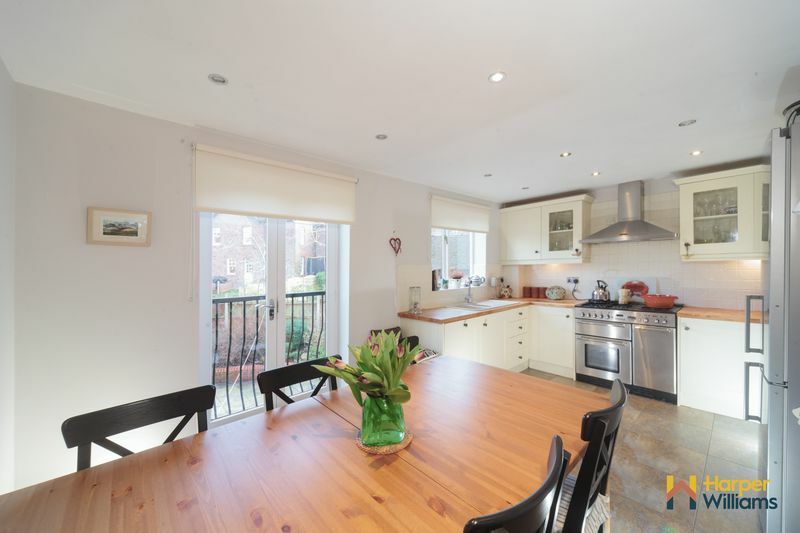 There is a central heating radiator, spotlights to the ceiling and ample natural light via the double glazed window to the rear and feature Juliette balcony with double doors. Another spacious landing with a feature circular pane to the side aspect, large storage cupboard, ceiling light point and access to all bedrooms. 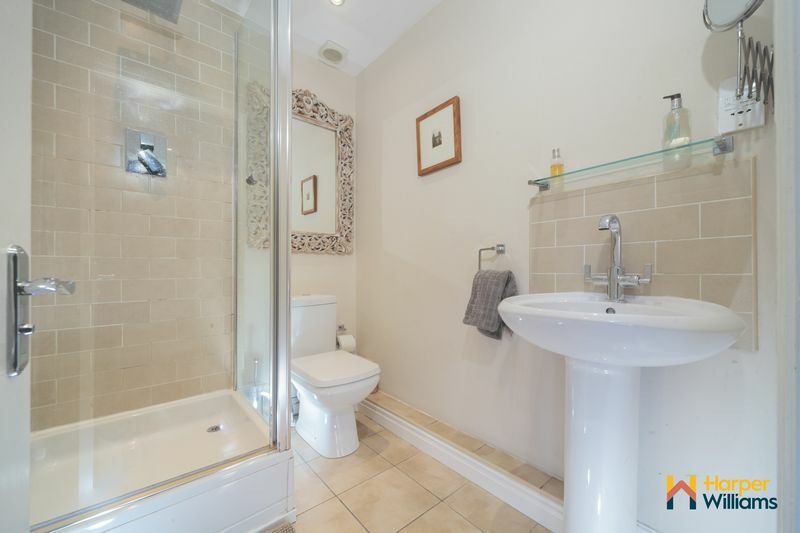 and family bathroom. A stylish master bedroom with stunning views across the prestigious golf course and beyond through two double glazed windows, benefiting from fitted wardrobes and drawers, warmed by a central heating radiator and with spotlights to the ceiling. Door into the ensuite. A contemporary ensuite shower room fitted with a three piece suite in white with chrome fittings comprising a tiled shower cubicle with a waterfall shower head, low level WC and pedestal wash hand basin, chrome ladder style radiator, modern tiling to the walls and floor, spotlights and also vented. 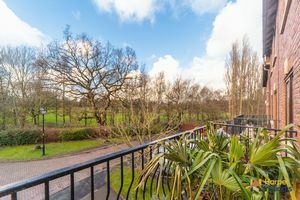 Situated to the rear of the property with a double glazed window overlooking the rear garden, central heating radiator and ceiling light point. 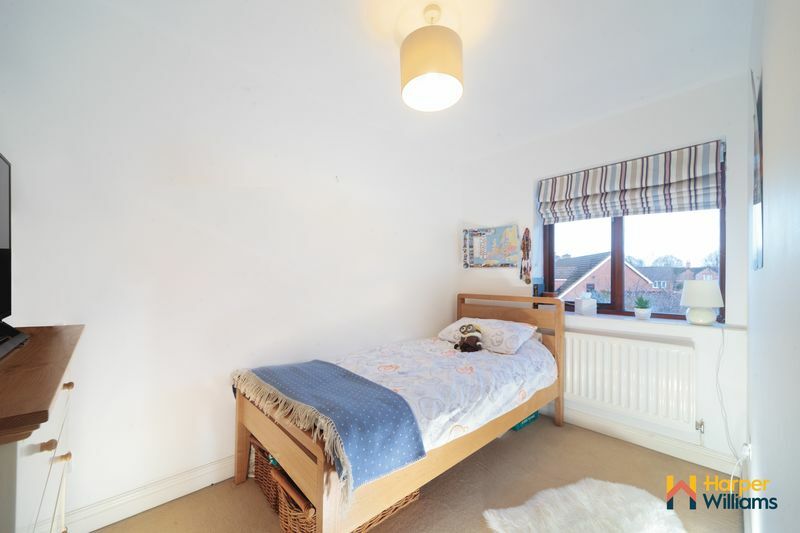 With a double glazed window to the rear aspect, central heating radiator and ceiling light point. 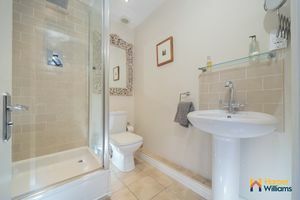 A spacious bathroom fitted with a three piece suite in white with chrome fittings, comprising a tiled bath, low level WC and pedestal wash hand basin. Chrome ladder style radiator, spotlights to the ceiling and vented. 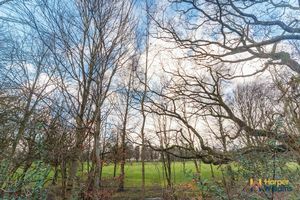 The property occupies a prime corner plot position, which enjoys fantastic views to the front aspect across the prestigious Leigh Golf Club and in particular faces the 14th hole! 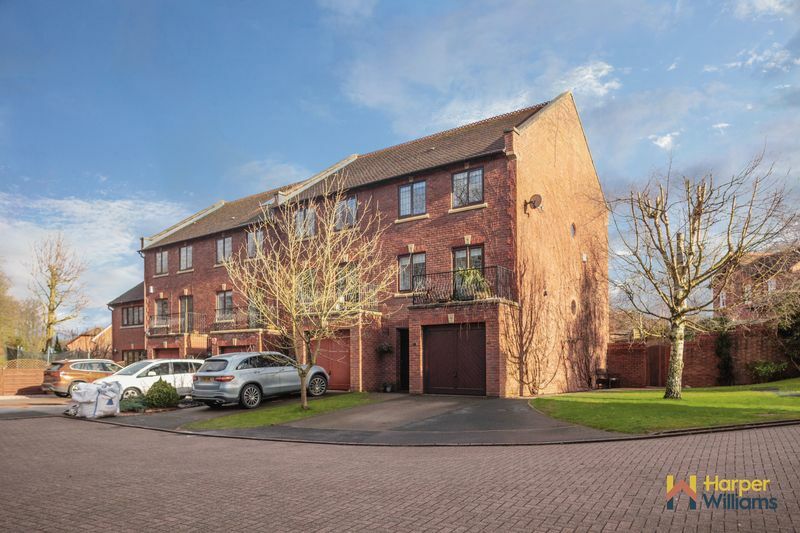 There is driveway for off road parking which in turn leads to an integral single garage, ideal for extra storage and secure parking if required. 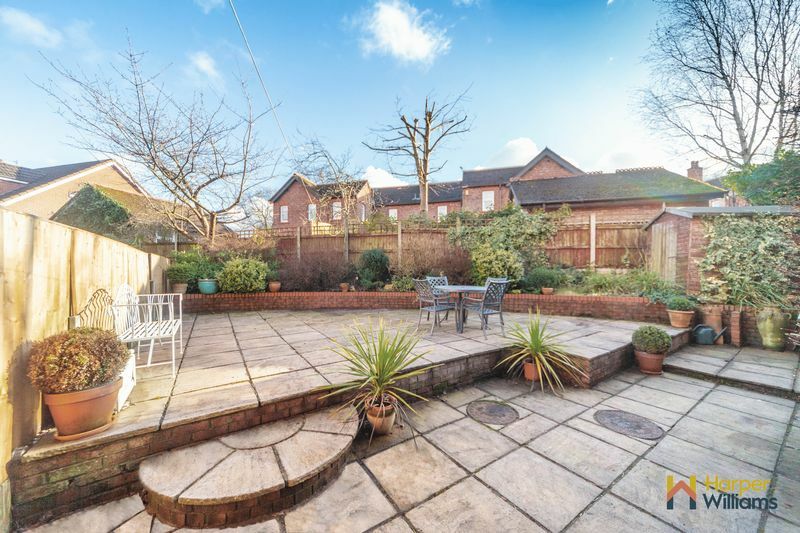 There is garden laid to lawn to the front and side boundaries. 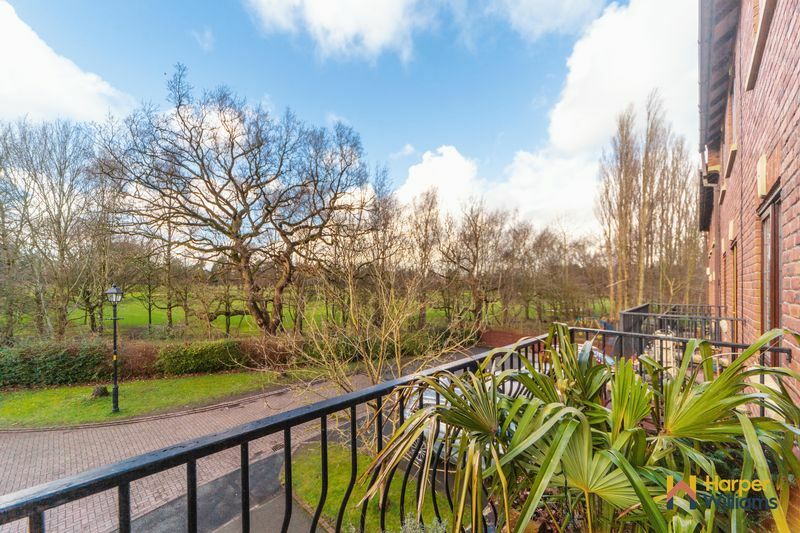 To the rear of the property, there is a fully enclosed sunny aspect low maintenance garden which is perfect for making the most of those summer days and evenings!